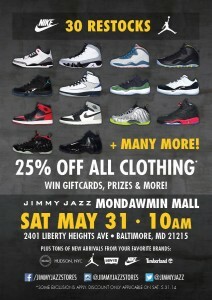 Jimmy Jazz is holding a restock event at their Mondawmin Mall location in Baltimore MD. Tickets will be given out on Thursday 5/29 and Friday 5/30. Winners must be present at the event held at the center of the mall on Saturday 5/31. If your number is called you will be allowed to enter the store and purchase a restock of your choice. Some of the restocked kicks include the Jordan Retro 1 and 9 Barons, Concord and Snakeskin 11 Lows, 3Lab5 Infrared, Yeezy Foamposites and Gamma 11’s. The Jimmy Jazz Mondawmin Mall store is located at 2401 Liberty Heights Ave, Baltimore, MD 21215. For more restock details visit the Jimmy Jazz website.